How can any Washington fan feel okay with an 0-3 start? It is difficult but there was little chance that DC was going to experience a championship run in RGIII’s sophomore year after the injury. It is definitely the case that the entire team is struggling at the moment. Week 3 has only proven much of the same that was seen in the previous two. RGIII’s field vision and stability is still off-balance. The defense still is woeful against both the run and the pass. The receivers are still lacking rapport with their QB and cannot find ways to get open for big plays (settling for a lot of underneath coverage routes and minimal gains). The offensive play-calling is mostly conservative, even though RGIII has racked up more than 300 passing yards in each of his first 3 games. The negative stats are starting to look really bad. The Redskins have given up the second most yards in their first 3 games in NFL history. They have averaged allowing over 30 points per game. They have only 1 TD in the first half of each of their first 3 games. A game against the Raiders next week is an opportunity to try for a real first win but Pryor could show up RGIII if the defense continues to play so poorly overall. The beginning of this game felt a bit like the Eagles game. Stafford threw an off-target pass, which got scooped up by DeAngelo Hall and returned for a touchdown. The fans got excited, but then the Redskins gave up 14 straight points on a combination of Joique Bell’s running and Stafford’s hookups with Megatron, Burleson, and Fauria. Meanwhile on offense, there was a little more movement this week, but the end result was close to the same. RGIII threw his fourth interception of the year but Morris burst out for a 30 yard TD run to tie it up before halftime, and then gave up a field goal. Finishing the first half only down by 3 points was a huge improvement. The second half left the two teams in similar straights. 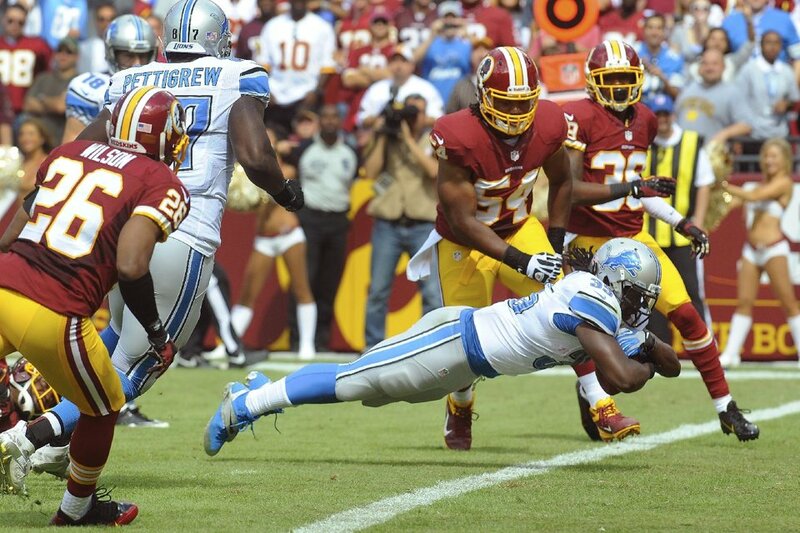 The Redskins began to hold the Lions offense in check a little more but was still given up major yards to both the passing and running game. On the reverse side, the offense did not get the burst of explosiveness needed to overtake Detroit. RGIII continued with little throws and the offense got away from the run game with Morris at times. On a big running play by RGIII, he dove head first and the ground caused a fumble (killing the momentum that he was finally achieving). This, of course, was also after a long bomb for a TD that was called back because Aldrick Robinson bobbled the catch when he hit the ground. Unable to stop Johnson from getting the lead-increasing touchdown and putting the Lions up by 10, the Redskins fell short again. Morris continues to look good running, but will not be able to fully unleash until the offense can get more balanced and comfortable in the first half. The defense had some moments of brilliance. Kerrigan is on point with his awareness. Hall went up against Megatron and tried his best, and got the pick 6. This part of the list is still longer. Tackling is still one of the defense’s most challenging issues. They let Bell break out of at least 10 tackles and extend runs by anywhere from 3 – 15 yards. 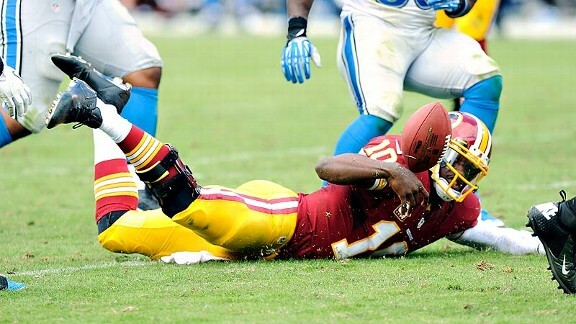 RGIII’s decision-making is the problem, not his legs. He is not reading the defenses correctly and taking too many risks. The head-first dive was a complete lack of attention when he was going to be able to slide feet-first and easily have the first down. The penalties are deflating. The Redskins continue to do a lot of the damage to themselves. Opposing offenses are going to carve up the secondary the whole season unless they can figure out how to properly cover when putting extra pressure on the opposing QB. On a separate note, Cousins is not the answer for this team. He is a great backup QB and might be able to play better than RGIII right now, but there is no proof that he would play well for the remainder of the season. He is more of a pure passer, but many are underestimating RGIII’s passing ability. He was accurate last year and in college. He can step back in the pocket when necessary. Without a preseason, his true nature for the season will come out by game 5. At that time, the team can reevaluate and decide if he needs more time to get back into his football form, though I would argue that he is a true athlete and needs to get back into it on the field. Andy Reid’s return to Philadelphia left the Eagles stunned as the Chiefs squashed the up-tempo style and forced 5 turnovers (4 from Vick). The Bengals surprised the Packers behind the running of Bernard and Green-Ellis. Dalton also pulled off the game-winning drive with a TD to Green. The Rams had no answer to the Cowboys, who looked good with Romo’s pass attack and Murray’s rushing. The Chargers struggled to finish their attempt at a comeback with something that looked like a hook & ladder play that went backwards. The Titans reaped the benefit of the botched play. 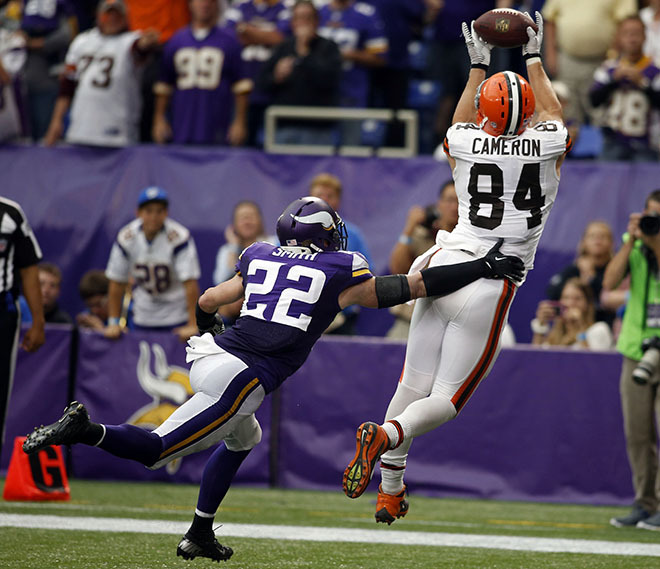 The Browns lose Richardson to the Colts but fall behind Hoyer for 3 TDs to Jordan Cameron to take out Peterson and the Vikings. Tampa Bay had nothing going as Freeman failed to complete even half of his passes. Brady, meanwhile, found Thompkins twice in the endzone. Brees and the NO offense had no problem carving up the Arizona defense for a 31-7 win. As woeful as the Redskins look, the Giants are that much worse. Eli threw another interception and was sacked 7 times in a blowout loss to Newton and the Panthers. Baltimore’s defense did the heavy lifting the prevented the Texans’ ability to pull off another comeback win with a interception return TD and punt return TD. In the matchup of rookies, Geno Smith got the better of EJ Manuel as he and the Jets’ running game edged out the Bills. Miami continues to surprise the NFL with a win against the Falcons to get to 3-0. Kaepernick and San Fran suffered on offense against this week against the Colts with a lost fumble and interception, leaving themselves to a 7-27 loss. Jacksonville may have scored more against the Seahawks than the 49ers did last week, but they also gave up 45 points with 4 TD passes by Russell Wilson. The Bears were able to sleepwalk into a win against the struggling Steelers, and waited until the fourth quarter to realize they needed to put it away with a TD pass and fumble recovery for a TD. Peyton is breaking more records with 12 TDs in his first 3 games of the season, after beating the Raiders 37-21. They are also averaging over 40 points per game.